Did you know that each type of firefly has its own light flashing pattern? So I doodled my jar and I think it looks more like a drinking glass with aluminum foil over the top than a lidded jar, so use a little imagination when you look at it. I stamped the insects and turned them into fireflies with a dab of yellow paint. I also scribbled this poem by Robert Frost on the page. Robert Frost is one of my favorite poets, and he was a native of New Hampshire where I live. This was a new poem for me, but it was perfect for my page. When I was a kid I had a book called Sam and the Firefly. 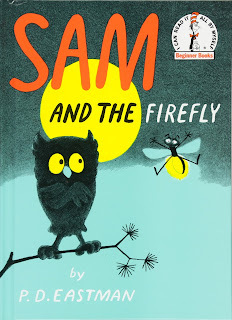 Sam is an owl who has Gus the firefly write words in the sky for him. Of course writing words in the sky at night isn't always a smart thing. Anyone else remember this book? I need to see if I can find mine, though it may be long gone. There is a box of kids books in the attic and it might be in there. So the newest challenge at Try It On Tuesday just happens to be Let It Shine, and I think my page works, so I am linking up. I'm finally home today after a couple of days out playing with friends. I should clean my house a little bit, but there's lots of other things I can think of doing other than that. I am really in summer mode. Oh boy. This is a wonderful journal entry, and a great two-fer, too. I saw fireflies the other night, but didn't even connect them with summertime love. You have given me yet another great example this month. It's a fabulous entry. I've never heard of the book, but that doesn't mean anything. I think I mostly read mysteries as a child. Still do. Your day sounds like mine. I finally cleaned house Friday and Saturday when it was cool during the early morning hours. I can't believe it took two days to dust, vac, and clean my kitchen. I will think of you as I do laundry today. 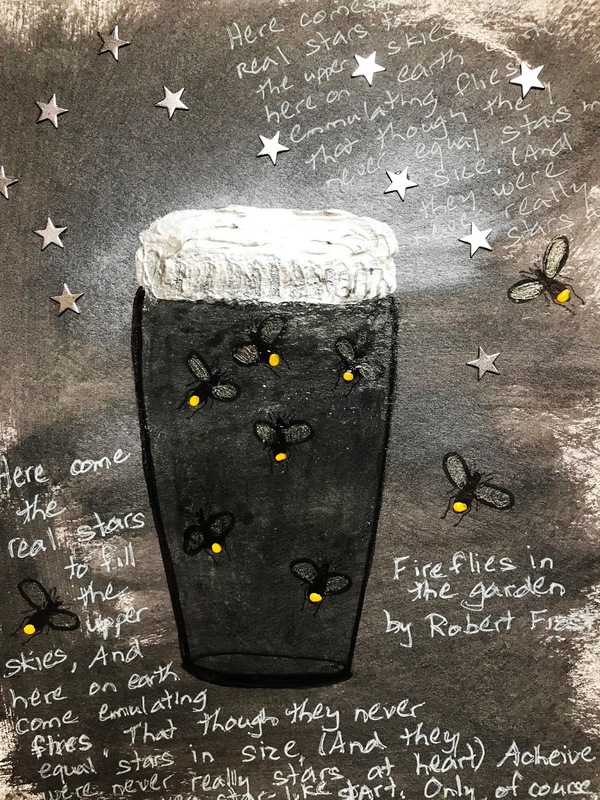 Thanks for sharing this beautiful firefly journal page with Art Journal Journey today. Your page is just GREAT - how clever is this?! Robert Frost had some very good poems and quotes.Your handwriting is super! Nice that it reminded you of one of the books of your childhood - would be great if you would find it again. Thanks a lot for another fantastic entry to AJJ and super to have you with us at TioT's again this time! Hope you enjoy your days with good weather and happiness! Everything o.k. here on latitude 48.7167 - longitude 15.0833 at the moment. It is a fabulous page Erika, the fireflies must be wonderful to see in real life. Here on your page they look wonderful. I likes the poem as well. Thank you for joining us over at TioT's, its a great page for the theme. What a sweet page. Watching fireflies on a Summer evening is so magical. Never read that book. The only book by PD Eastman that I read was Are You My Mother? Stay cool! A great page, Erika! Love the design and how you've created these lovely fireflies. The Robert Frost poem is really beautiful! Thank you for joining us at Try It On Tuesday! I love fireflies. See a lot here, not so many, if any, up north. Love this piece! As I child I loved catching fireflies -- we do not have them here in Florida but there were tons of them in the mountains of North Carolina. Your fireflies are wonderful! A great page Erika and I love the poem too.